Pusey House was founded in 1884 at 61 St Giles, and Nos. 57–59 were acquired later. These three houses were demolished in 1911 to make way for Pusey House Chapel of the Resurrection, erected between 1912 and 1914 on the corner of Alfred Street (renamed Pusey Street in 1926). The chapel, which was designed in the late Gothic style by Temple Moore, was dedicated on 10 October 1914. It is Grade II listed along with the rest of Pusey House (List Entry No. 1047109). 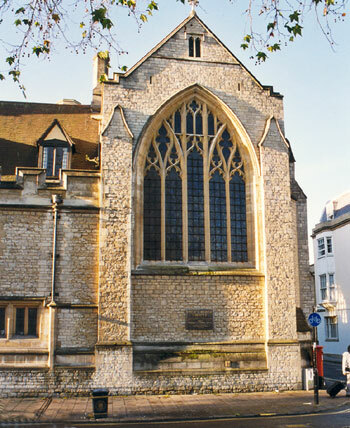 There is a large section used mainly for Sunday worship divided from a smaller chapel at the east end by a solid stone screen. The east window shown here was added by Sir Ninian Comper in 1935–6. The boundary between St Giles parish and St Mary Magdalen parish ran between Nos. 57 and 58, so this chapel stands partially in each parish.